“Nothing seemed to come easy for Tim Tebow, including being born.” This is the story of how he overcame difficulties to become one of the most successful college football players. As part of the Blue Banner Biographies brought out by Mitchell Lane Publishers, these books have a standard format of five well organized chapters with plenty of additional information provided in the back matter. The print is easy to read, and the photographs are sure to attract fifth grade sports fans. 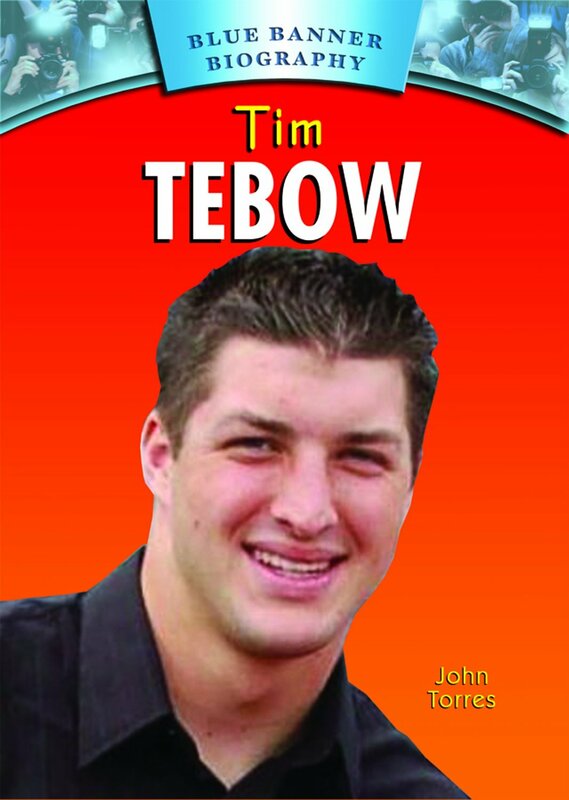 Tim Tebow was born in the Philippines, the youngest of five children. His parents moved back to the United States when he was three years old. Five year old Tim told his parents he wanted to play sports. This was nearly a problem for Tebow being a homeschooled child, but luckily the law changed in 1996, allowing homeschooled children to play for their local high school. Tebow’s toughness keeps him going in the face of adversity. While in high school he played nearly an entire game with a broken leg bone. His success in high school football made him a sought-after college recruit, eventually choosing to play the Florida Gators. With Tebow’s talent, the team gained its second national title in three seasons. He was the first sophomore in NCAA history to win the coveted Heisman Trophy. 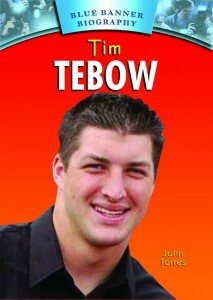 We learn that there is more to Tim Tebow than just being a great football player. Even while in college, he went on mission trips around the world. Currently, to give back to the world, Tebow started the WISH Program to grant wishes to sick children, as well as, “Timmy’s Playroom” for children with a terminal disease. Tebow now plays forthe New York Jets. What’s next for this amazing athlete? The book is written for ease of comprehension and gives young sports enthusiasts a reason to read and find out.